As of January 1, 2016, four states, the District of Columbia, and three local jurisdictions have enacted taxes on vapor products (electronic cigarettes), but their methods and levels of taxation vary dramatically. 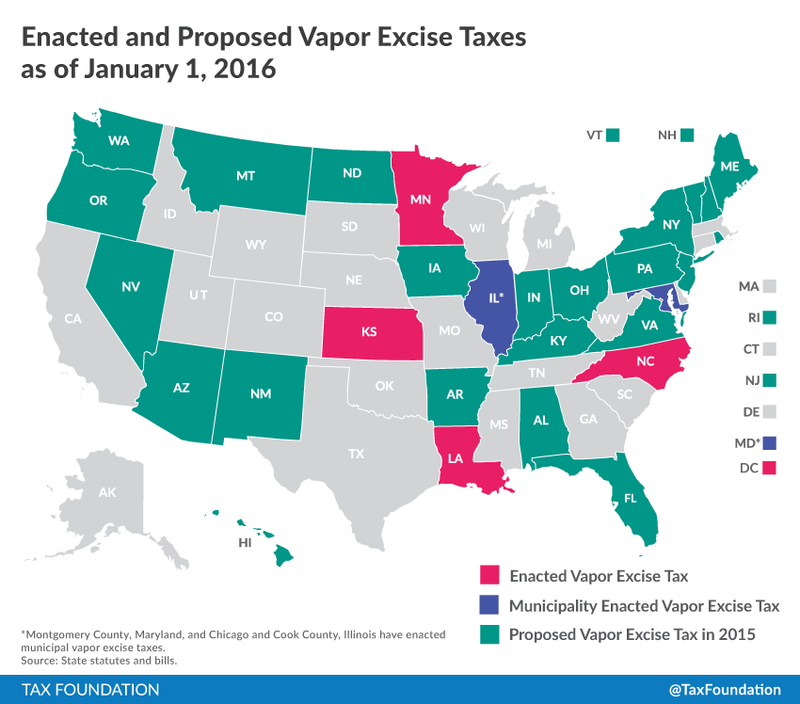 In 2015, at least an additional 23 states considered excise taxes on vapor products. Vapor products are generally found to have a much lower risk profile than traditional incinerated cigarettes. Public Health England, housed in the British Department of Health, issued findings that vapor products are 95 percent less harmful than cigarettes and can serve as an effective tobacco-cessation method. Vapor products likely have much lower externalities than traditional cigarettes, and it follows that the excise taxes on the products should be lower or nonexistent. Punitive taxes on vapor products could inadvertently close out options for cigarette users looking to quit. Vapor products, also known as electronic cigarettes, have grown steadily in popularity since their market debut in 2007. While mostly consigned to the relative obscurity of shopping mall kiosks and online sales for the first few years of their existence, vapor products have now become ubiquitous at gas stations, convenience stores, and dedicated stand-alone vapor stores. According to Wells Fargo Securities, though the vapor market is currently much smaller than the traditional cigarette market, it grew by 23 percent in 2014, and some project that vapor products will surpass traditional cigarettes in consumption over the next decade. One of the main challenges for policymakers is determining how these emerging products should be treated with respect to tax policy. Excise taxes as a whole make up 3 percent of the federal budget, and tobacco taxes specifically comprise an average of 2 percent of state budgets. Legislators must determine whether vapor products should be classified as tobacco products and how or whether they should be taxed. Each of the states which have levied special taxes on vapor products to date—Minnesota, North Carolina, Louisiana, Kansas, and the District of Columbia—relied on unique policy rationales and implemented different methods of taxation. As vapor products have proliferated, debates over their public health implications have played out across the media and in health journals. Some reports have emphasized the potential for electronic cigarettes to cause damage to the lungs. Policymakers and citizens have also expressed concern that electronic cigarettes may serve as a gateway to traditional tobacco products, particularly among minors. Conversely, other health professionals and policymakers view vapor products as a viable smoking cessation method for some smokers, contributing to improvements in public health. A number of studies suggest that vapor products can play a significant role in harm reduction by reducing consumption of traditional cigarettes. What can be stated with certainty is that vapor products differ sharply from traditional incinerated cigarettes in their construction, use, and health risks—distinctions with important implications for taxation. Cigarettes, of course, are shredded tobacco leaves wrapped in paper, frequently with a cotton filter attached. When lit, tobacco smoke is drawn into the lungs. Vapor products are more complex (see Figure 1). A vapor device contains a battery, a cartridge containing nicotine fluid that can also include flavorings, an atomizer (usually a heated coil), an LED light that turns on when the device is in use (and is sometimes designed to simulate the flame from a cigarette), and a sensor which detects when a person is inhaling and activates the atomizer and LED light. Once the sensor is triggered, the atomizer heats the fluid and converts it to vapor, which is then inhaled. The important difference between traditional cigarettes and vapor products is that there is no flame or burning in a vapor product. While some vapor products can resemble traditional cigarettes, the similarity is largely aesthetic. The adverse health effects of traditional incinerated cigarettes are well documented. Medical research stretching back at least to the 1960s has linked smoking to lung cancer, heart disease, stroke, and other health problems. In 1968, the tobacco scientist R.L. Stedman listed 1,200 tobacco and smoke components; by 2009, Alan Rodgman and Thomas Perfetti had identified as many as 8,400, including carbon monoxide, formaldehyde, and ammonia. Some researchers have estimated that there are more than 100,000 chemicals in traditional incinerated cigarette smoke. Growing public awareness of the health implications of smoking contributed to a 50 percent drop in adult current smokers between 1965 and 2011. Vapor products are generally found to have far fewer harmful chemicals in their composition. Two recent major literature review studies assess concerns about the risk profile of vapor products. 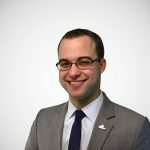 The first, published in 2011, is by Zachary Cahn, a professor in the Department of Political Science at UC Berkeley, and Dr. Michael Siegel, a professor at the Boston University School of Public Health. Their review additionally addresses specific chemical concerns as well, with these appearing to be modest in comparison to chemicals in incinerated tobacco. Cahn and Siegel note “Other than TSNAs [tobacco-specific nitrosamines] and DEG [diethylene glycol], few, if any, chemicals at levels detected in electronic cigarettes raise serious health concerns.” They caution that, in an absolute sense, e-cigarettes are not completely risk free, but they are a much better choice than traditional cigarettes. Some have suggested that the levels of tobacco-specific nitrosamines (TSNAs) in vapor products should be cause for concern. However, one study out of New Zealand finds that the levels of TSNAs in a particular brand of vapor cartridge “are 1200 times less than in the tobacco of 20 manufactured cigarettes”. Another independent review of an FDA report on the chemical components of vapor found that the amount of TSNAs reported was below the limits of quantification. In essence, the FDA and other researchers could not find anything more than trace amounts of TSNAs in e-cigarette vapor. Vapor products have the potential to be a boon to public health by acting as a less risky alternative to traditional incinerated cigarettes. A recent article in the British Journal of General Practice found that for every million smokers who switched to vapor, 6,000 deaths could be prevented each year in the United Kingdom. Similar gains could be made in the United States, with 4.8 million deaths being prevented over 20 years using vapor products as a major part of a tobacco harm reduction plan. A recent study out of Italy followed 300 smokers who were not intending to quit over a 12-month period as they switched to using e-cigarettes. By the end of the study, 8.7 percent of the participants ended up quitting smoking entirely, and 10.3 percent had reduced how much they smoked. These and other findings have prompted the UK government to issue research conclusions around them. In August of 2015, Public Health England, housed in the British Department of Health, released a study finding that vapor products are 95 percent less harmful than cigarettes and should be promoted as a tobacco-cessation method. Critics of vapor products do, however, raise concerns about vapor products appealing to young people, or being used concurrently with traditional cigarettes. The flavoring of vapor products remains a strong point of contention, with anti-tobacco groups claiming they make the products attractive to children, and vapor manufacturers pointing out that some flavoring is necessary, as vapor fluid is naturally flavorless until flavor is added, unlike traditional cigarettes, which naturally have a taste. The Truth Initiative, an anti-tobacco group, released a position paper in December of 2015 on vapor products detailing some of these concerns, and including findings of vapor product use by young people. They show that 13.4 percent of high schoolers report having used a vapor product in the last 30 days, up from 1.5 percent in 2011. While health research is promising, the vapor category is still new, and there have been some growing pains around how the federal government treats the products. In 2014, the Food and Drug Administration (FDA) issued its plan to extend regulatory authority to vapor products. The agency has had authority over traditional cigarette, roll-your-own tobacco, and smokeless tobacco for the last six years, and will extend its authority to vapor products after these plans have been finalized. Until these questions are answered, states are in some ways left in the lurch, as the FDA’s findings and guidance on the relative risks of vapor products and how new products enter the market will, in many ways, inform the state legislative process. States have been less slow to act on vapor products, as a number of states have proposed or enacted taxes on vapor products. Table 1 summarizes current provisions in four states and the District of Columbia, along with legislation introduced in other states during the 2015 legislative session. In the 2015 legislative session, at least 25 states and the District of Columbia considered legislation to tax vapor products, either as part of a budget proposal or as a stand-alone bill. Ultimately, Louisiana, Kansas, and the District of Columbia enacted such legislation, bringing the total number of states taxing vapor products to five. Additionally, Montgomery County, Maryland, and Cook County and the City of Chicago in Illinois enacted vapor taxes in 2015. Minnesota and North Carolina began taxing vapor products in 2012 and 2014, respectively. Each of these enacted levies varies in structure and were put in place under different circumstances. Minnesota was the first state to begin taxing vapor products. On October 22, 2012, the state’s Department of Revenue issued a revenue notice stating that electronic cigarettes, as a “product containing, made, or derived from tobacco” and intended for consumption, fell under the definition of “other tobacco products,” a tax category that in many states includes pipe tobacco, chewing tobacco, and snuff. As a result, they are now taxed at the rate of 95 percent of their wholesale price. In addition to being the first state to tax vapor products, Minnesota remains the only state to do so administratively rather than legislatively. North Carolina, the second state to tax vapor products, took a different approach. In 2014, the state legislature enacted legislation taxing vapor products at a rate of 5 cents per milliliter of nicotine fluid. In the 2015 session, Kansas and Louisiana followed suit, adopting variations on the North Carolina approach of taxing by volume. Both states were prompted to impose vapor taxes to help close budget shortfalls; Kansas faced a deficit of nearly $600 million, while Louisiana stared down a $1.6 billion shortfall. Most state excise taxes on products like alcohol, traditional cigarettes, and gasoline are levied as what is called a “specific” tax, or a tax based on volume. Minnesota, by contrast, currently taxes vapor products on an ad valorem basis, meaning as a percentage of the sale price of the product. In Minnesota, the tax is levied at the point of wholesale. Whether intentionally or not, using ad valorem taxes on vapor products results in disparate tax treatment of these products. Some vapor products are single-use, while others are rechargeable and refillable. An ad valorem tax hits disposable e-cigarettes harder than a specific tax, since disposables include the value of the plastic device itself, not just the fluid, in its sale price. Because single-use e-cigarettes do not require the prior purchase of a personal vaporizer device, they may be favored by lower-income smokers, upon whom the comparably higher tax could fall disproportionately. Moreover, for either type of device, high taxes may prove prohibitive for low-income smokers wishing to transition away from traditional cigarettes. In 2015, some Minnesota lawmakers attempted to modify their current method of taxation through two different bills, House File 2182 and Senate File 2025, which would have moved Minnesota to a specific tax on vapor liquid at $0.30 per milliliter. Though still high compared to the other states that have imposed taxes on the product, it would have brought the taxation of vapor products under a more equitable regime. Ultimately, however, neither bill received a floor vote. One of the principles of sound tax policy is neutrality, the idea that taxes should have equity across different activities so as not to favor one type of business or personal decision over another. Put another way, taxes are designed to raise revenue for government services, not micromanage choices. In a strict application of this principle, all consumer products would be subject to a broad based consumption tax like a retail sales tax, and additional levies on tobacco, alcohol, and other “sins” have no place. Some economists make exceptions for special circumstances where they can demonstrate a quantifiable negative externality, or side effect, of the use of a specific product. In the case of traditional incinerated cigarettes, these externalities are largely in the form of the social costs associated with the adverse health effects of smoking. Frequent smokers tend to develop serious health problems, including lung cancer, chronic obstructive pulmonary disease (COPD), and heart disease. Ultimately, many of the economic costs of these health problems are socialized through government programs such as Medicare and Medicaid. Tobacco taxes are sometimes justified by economists on these grounds, with cigarette taxes envisioned as a way to not only disincentivize smoking but also to help fund smoking prevention and public health programs. The theory goes that applying a tax to a product of exactly the same size as the externality would help users “internalize” the external costs of smoking. Electronic cigarettes, with their lower risk profile, are likely to have less external costs associated with their use. Further, to the extent that smoking cessation is a stipulated goal of tobacco taxation, exposing vapor products, which many see as a promising cessation method, to such hefty tax rates as traditional tobacco would be counterproductive. Entirely separate from externality theory, some would suggest that whatever the tax on traditional tobacco, the most important thing is that taxes on less risky activities are lower, so that users are incentivized, or “nudged,” to make a switch to the less risky activity. In practice, beyond efforts to internalize the costs of smoking or to shape risky decision making, cigarette taxes are frequently relied on as a politically expedient means of funding for unrelated programs. It is instructive to note that even money derived from tobacco settlements has rarely gone directly to smoking prevention. Education is a public good. It should be paid for with broad-based, generally applicable taxes. Schools should be important enough to be paid for with real taxes on income, sales, and property. Why foist the cost onto a minority — and given the demographics of those who smoke, a poor minority? Vapor products are sufficiently new that states are just beginning to grapple with questions of if, and how, to tax them. Their apparent similarity to traditional cigarettes, despite significant areas of divergence, has complicated this debate. But vapor products and traditional cigarettes work and are measured in fundamentally different ways, and as a result should not be taxed in the same way. Additionally, research demonstrates that vapor products are significantly less harmful than traditional cigarettes, and have potential to serve as a means of tobacco harm reduction. Most states that have a tax on vapor products levy it at a specific rate, based on volume. This method has notable advantages, as it avoids discriminating between disposable and reusable products and does not punish lower-income cigarette smokers who may want to switch to vapor products. Minnesota, the first state to tax vapor products, imposed the tax at an ad valorem rate of 95 percent of the wholesale price, and some legislators have since sought to convert the tax to an excise at a specific rate. A sound approach to the taxation of vapor products would avoid discriminating between disposable and rechargeable vapor products; it would avoid extending punitive tax rates from traditional cigarettes to vapor products, and would not hinder consumer opportunities for the use of vapor products as a method of smoking cessation. The author would like to thank Ben Bristor for his assistance on this report. “Open System Vaporizers Officially Overtake E-Cigs, Top $1 Billion in Sales for the First-Time Ever.” Marketwatch. September 25, 2014. http://www.marketwatch.com/story/open-system-vaporizers-officially-overtake-e-cigs-top-1-billion-in-sales-for-the-first-time-ever-2014-09-25. Phil Wahba. “U.S. e-cigarette sales seen rising 24.2% per year through 2018.” Fortune. June 10, 2014. http://fortune.com/2014/06/10/e-cigarette-sales-rising/. “State Government Tax Collections – Historical Data.” United States Census Bureau. http://www.census.gov/govs/statetax/historical_data.html. See, e.g. : Nitzkin, Joel. “The Case in Favor of E-Cigarettes for Tobacco Harm Reduction.” International Journal of Environmental Research and Public Health 11, no. 6 (June 2014). http://www.ncbi.nlm.nih.gov/pmc/articles/PMC4078589/; Caponnetto, Pasquale, Davide Campagna, Fabio Cibella, Jaymin B. Morjaria, Massimo Caruso, Cristina Russo, and Riccardo Polosa. “EffiCiency and Safety of an eLectronic cigAreTte (ECLAT) as Tobacco Cigarettes Substitute: A Prospective 12-Month Randomized Control Design Study.” PLOS One (June 24, 2013). http://journals.plos.org/plosone/article?id=10.1371/journal.pone.0066317. Rodgman, Alan, and Thomas Perfetti. The Chemical Components of Tobacco and Tobacco Smoke. 1st ed. New York: CRC Press, 2009. “Trends in Current Cigarette Smoking Among High School Students and Adults, United States, 1965–2011.” Centers for Disease Control and Prevention. November 14, 2013. http://www.cdc.gov/tobacco/data_statistics/tables/trends/cig_smoking/. Cahn, Zachary, and Michael Siegel. “Electronic cigarettes as a harm reduction strategy for tobacco control: A step forward or a repeat of past mistakes?” Journal of Public Health Policy 32 (2011): 16–31. December 9, 2010. http://www.palgrave-journals.com/jphp/journal/v32/n1/full/jphp201041a.html. Farsalinos, Konstantinos E., and Riccardo Polosa. “Safety evaluation and risk assessment of electronic cigarettes as tobacco cigarette substitutes: a systematic review.” Therapeutic Advances in Drug Safety 5, no 2. (April 2014): 67–86. http://www.ncbi.nlm.nih.gov/pmc/articles/PMC4110871/. Laugesen, Murray. “Safety Report on the Ruyan e-cigarette Cartridge and Inhaled Aerosol.” Health New Zealand Ltd. October 30, 2008. http://www.healthnz.co.nz/RuyanCartridgeReport30-Oct-08.pdf. Lindsay, Janci Chunn. “Technical Review and Analysis of FDA Report: ‘Evaluation of e-cigarettes.’” Exponent. July 30, 2009. http://casaa.org/uploads/Exponent_Response-to-the-FDA-Summary.pdf. West, Robert, and Jamie Brown. “Electronic cigarettes: fact and faction.” British Journal of General Practice 64, no. 626 (September 1, 2014): 442–443. http://bjgp.org/content/64/626/442. Nitzkin, Joel L. “The Case in Favor of E-Cigarettes for Tobacco Harm Reduction.” International Journal of Environmental Research and Public Health 11, no. 6 (June 20, 2014): 6459–6471. http://www.ncbi.nlm.nih.gov/pmc/articles/PMC4078589/. Caponnetto, Pasquale, et al. “EffiCiency and Safety of an Electronic Cigarette (ECLAT) as Tobacco Cigarettes Substitute: A Prospective 12-Month Randomized Control Design Study.” PLOS One (June 24, 2013). http://journals.plos.org/plosone/article?id=10.1371/journal.pone.0066317. McNeill, A., et al., “E-Cigarettes: An Evidence Update.” Public Health England. August 2015. https://www.gov.uk/government/publications/e-cigarettes-an-evidence-update. 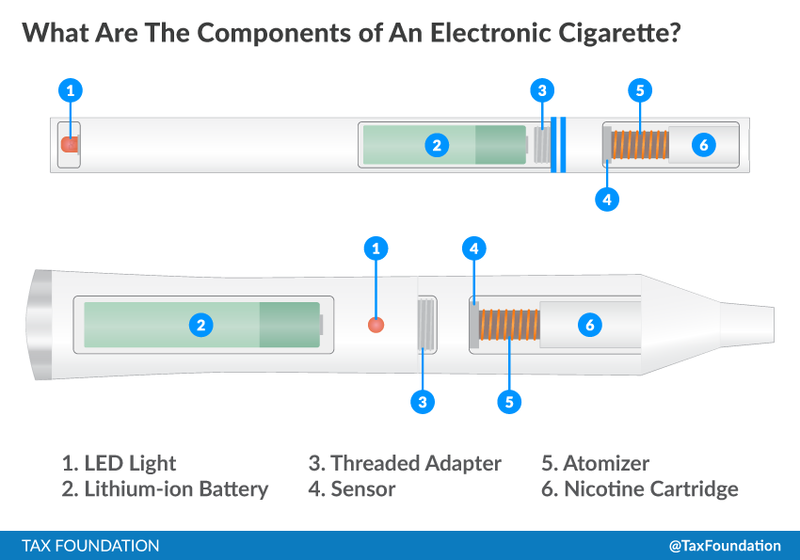 “The Truth About: Electronic Nicotine Delivery Systems.” Truth Initiative. December 2015. http://truthinitiative.org/sites/default/files/ENDS%20Fact%20Sheet%20-%201%204%2016%5B1%5D.pdf. Food and Drug Administration, “FDA Issues First Product Marketing Orders through Premarket Tobacco Application Pathway”, Press Release, November 10, 2015, http://www.fda.gov/NewsEvents/Newsroom/PressAnnouncements/ucm472026.htm. “House Appropriations Subcommittee on Agriculture, Rural Development, Food and Drug Administration Holds Hearing on President Obama’s Fiscal 2017 Budget Proposal for FDA.” Congressional Hearing. February 25, 2016. “Revenue Notice #12-10: Tobacco Products Tax – Taxability – E-cigarettes.” Minnesota Department of Revenue. October 22, 2012. http://www.revenue.state.mn.us/law_policy/revenue_notices/RN_12-10.pdf. Drenkard, Scott. “North Carolina’s E-Cigarette Tax Proposal.” Tax Foundation. May 27, 2014. https://taxfoundation.org/blog/north-carolina-s-e-cigarette-tax-proposal. Sugarman, Stephen D. “To Help Smokers Quit, Make Them Vapers.” Los Angeles Times. September 16, 2015, http://www.latimes.com/opinion/op-ed/la-oe-0910-sugarman-encourage-vaping-20150910-story.html. “15 Years Later, Where Did All the Cigarette Money Go?” NPR. October 13, 2013. http://www.npr.org/2013/10/13/233449505/15-years-later-where-did-all-the-cigarette-money-go. See, e.g., Brunori, David. “Using Local Cigarette Taxes for Schools Is Silly.” Tax Analysts. August 20, 2014. http://www.taxanalysts.com/taxcom/taxblog.nsf/Permalink/SCAO-9N6HML?OpenDocument. MAP: Has Your State Proposed or Enacted a Vapor Excise Tax?